Atlas Wearables | We Love Vegetables! Remember when you were a kid and your mom would sneak veggies into your dinner by hiding them under your favorite foods? Or when your parents would try to get you to watch Popeye to show you that it was awesome to eat spinach? Maybe you were one of those kids that always loved veggies, but I definitely remember fighting to eat my veggies. Now as an adult, I can't get enough veggies. I try to include them with every meal. Not only do they taste delicious, they are some of the best foods for our bodies and can help prevent all sorts of diseases including cancer and heart disease. Vegetables contain fiber! Fiber helps lower cholesterol, reduces the risk of heart disease, and assists with... smooth sailing. Vegetables contain potassium! Potassium is essential to maintain electrolyte and fluid balance in the body. This also helps with those horrible Charley horses that can be oh so painful. Vegetables help your skin glow! Veggies hydrate your skin as well as phytonutrients which help prevent cell damage caused by stress and toxins in our environment. It is best to eat veggies that are in season to ensure you are getting the freshest and nutrient-rich produce. They are also cheaper when in season, too! 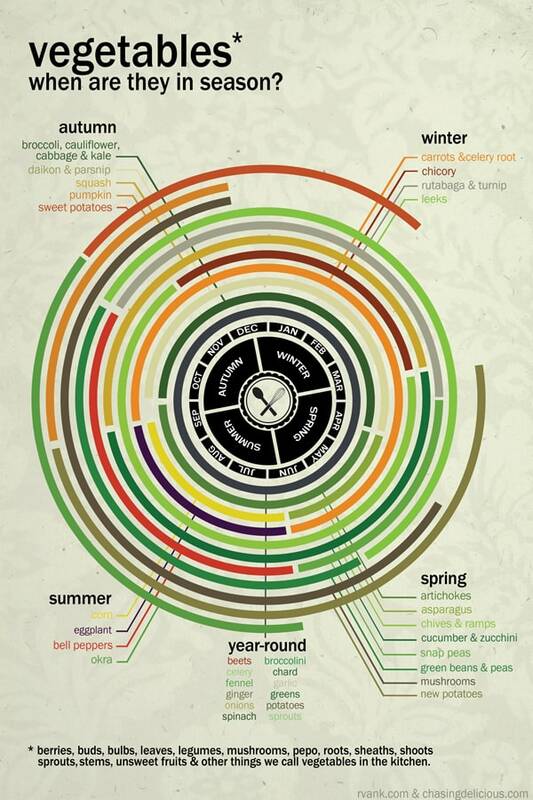 Check out this helpful graph to remember what vegetables are in season. Try a 21-day veggie challenge, to get you on track!